From the author of the New York Times best-selling Abraham Lincoln: Vampire Hunter comes Unholy Night, the next evolution in dark historical revisionism. In Grahame-Smith's telling, the so-called "Three Wise Men" are infamous thieves, led by the dark, murderous Balthazar. After a daring escape from Herod's prison, they stumble upon the famous manger and its newborn king. The last thing Balthazar needs is to be slowed down by young Joseph, Mary, and their infant. But when Herod's men begin to slaughter the first born in Judea, he has no choice but to help them escape to Egypt. History takes on a life of it's own as demonstrated by this story. Time changes things. Over the centuries minor insignificant characters become something much larger than life, ordinary men become heroes. The characters in this tale are well developed and ultimately human yet as we know, they have taken on a somewhat supernatural aura through the centuries. This could have happened very much like this story describes, we'll never know, but then again, maybe we will someday. I very much enjoyed the idea that these characters taken out of context could have been much different than "history" remembers them. Tales that make you think "it could have happened" stay with me for weeks after the book is finished and this is one I will remember a long time. The author has taken a tale so well known and developed it, or perhaps unravelled it would be a better way to describe it, into a story that is both familiar and believable. A nice twist to the greatest story ever told. I don't know how much of the historical background of the Roman Empire and the Roman characters Grahame-Smith took from actual facts, but I felt that this book really helped me get a perspective on how evil and corrupt the government of the time period was. If half of what he wrote about Herod is true he is one of the most evil men to ever live. As a Christian and a fan of Grahame-Smith I was excited to read this story. I was worried that it would either be a poor read or offensive to my beliefs. I am happy to say I was wrong on both counts. The book is not my favorite of the author's, but I did really enjoy it. As a follower of Christ I am happy to say that nothing that Smith wrote contradicted the character or divinity of Jesus. I don't know if Smith is a Christian or not, but he took a potentially explosive topic and handled it very well. The book gave me more of an appreciation of the hardships Joseph and Marry went through in this time period. For those who choose to read this book based on my recommendation I feel that I should give you two warnings. First, some nonessentials to the story have been changed (some of the facts about the life of Jesus are wrong.) However, these errors did not offend me or take away from the fact that He was the Son of God who came to save the world. Second, there is some bad language and a lot of graphic violence. Yes, this book has Zombies! This was not a book I expected to like. I bought it because I really liked Abraham Lincoln, Vampire Hunter and was looking for something else by the same author. My choices were Pride and Prejudice and Zombies...and Unholy Night. I thought I was picking the lesser of two evils when I chose this one. 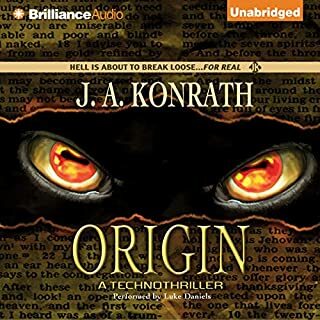 At first, I thought I probably would not listen past the first chapter or two; I wasn't enthusiastic about the subject matter or the narrator's voice - but before I realized it, I was captivated by the story and grateful for the choice of narrator. Both author and narrator have done a great job. There's nothing here to offend the especially religious or the especially unreligious. 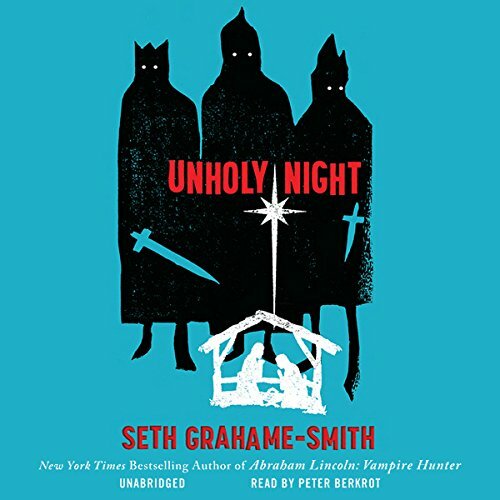 It's a very different story than Abraham Lincoln, Vampire Hunter - but having now listened to both, it is Unholy Night that I will replay firrst. Loved it. What a page turner. A must read!! Smith is a master of story telling. Highly recommended. Can't wait for his next creation. Absolutely. 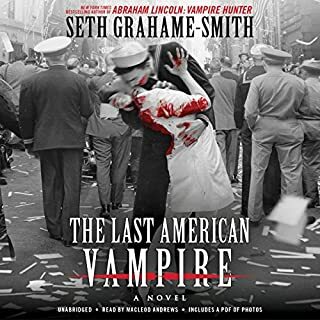 Seth Grahame-Smith is an incredibly unique spinner of what we've become accustomed to. 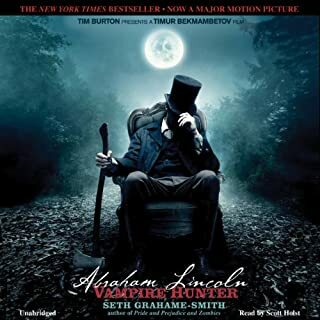 Y'know - Abe Lincoln is a vampire hunter; lovely Elizabeth Bennet on a quest to end a zombie plague in a retelling of Jane Austen's Pride & Prejudice; and most recently in his The Last American Vampire, sequel to Abraham Lincoln - Vampire Hunter. Tucked in among these beauties is Unholy Night. In the tradition of Rosencrantz and Guildenstern are dead, Grahame-Smith tells about the Three Wisemen from the Bible - Balthazar, Melchior, and Caspar. And at the risk of exposing my inner heathen, they're bad-asses. Balthazar - Peter Berkrot plays him perfectly. Charismatic, endearingly arrogant, full of dry wit, and extraordinarily cunning. Balthazar - Peter Berkrot plays him perfectly. Charismatic, endearingly arrogant, full of dry wit, and extraordinarily cunning. Berkrot has the perfect delivery for this book. He's eloquent yet seedy. He has a rich 'drive' (so-to-speak) to his voice that lends heavily to it's subject matter; bordering on regal while making you feel as though you're very lucky to be in on this "true" story about the Three Wisemen that many people don't know. My subject line refers to the fact that I know Peter Berkrot personally. So while I'm more than inclined to sing him praises even if he were terrible (LOL! ), this is actually the first book of his that I listened to. As a human being, he's such a pain in the *ss, but as a narrator he's blown me away. I asked him to recommend one of his faves that he's narrated over the years and he told me Unholy Night. I can see why. It's an outstanding story made all the more so with perfect casting. I can't recommend Unholy Night enough. As for his other books. Meh. We'll see. LOL! If you happen to read this, truly impressive, Peter. Truly impressive. Yes. I enjoyed this book almost as much as ALVH. I would have said, as much, but right at the end it seemed that the author got in a hurry and rushed the ending. But, overall it was well worth the time and money. What was one of the most memorable moments of Unholy Night? I would have said that it was the Zombie attack, but the action seemed to be abbreviated. Almost as if, like the ending, the story was over edited or rushed to an ending. Have you listened to any of Peter Berkrot’s other performances before? How does this one compare? Not your Mother's nativity story! The author's imagination is amazingl to come up with this story.The story is well written. This is one of the best retellings of the nativity that I've read. Grahame-Smith is careful not to denigrate the biblical story (except where the magi are concerned), bringing the story to life in a way the Bible does not. I didn't read it expecting it to reaffirm Christianity (I read it hoping for zombies), so I'm surprised how carefully he manages to keep the original story there and add his own elements to liven and provide emotion to the narrative. 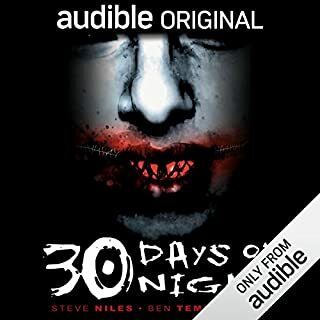 Where does Unholy Night rank among all the audiobooks you’ve listened to so far? 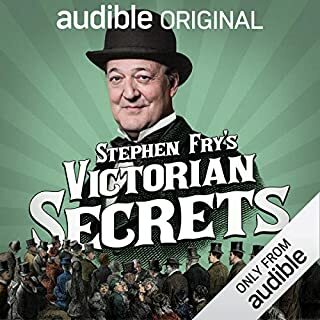 One of the best two audiobooks I've listened to. I liked how the plot continually returned to an ibex's point of view. The author refers to ibexes as clueless animals, but the Nubian ibex has some rather extraordinary traits -- admittedly off-topic for the book. I also liked how the author introduced each chapter with a relevant quote from the Bible. I originally thought the book would be sacrilegious, but the opposite was true. "The Hebrew God" provided miracle after miracle -- supernatural, personal -- that even the characters' hardest hearts softened and came to believe, not necessarily fully understanding why, that the newborn Jesus was more than a usual infant. I suppose the scene in Bethlehem when "the three wise men" first entered the stable with far-from-reverent dispositions and, the next day, returned to protect Mary, Joseph, and Jesus, permitting all six of them to escape the town despite Herod the Great's intent desire to have them captured and/or killed. The Bible actually says very little about the Three Wise Men (or kings or magi or, in some modern versions of the Bible, astrologers). Only one book of the Bible, the Gospel of Matthew, mentions them, with scant details. Most of our collective knowledge of the magi comes from culturally specific story-telling, carols, myths, denominational beliefs, traditions, Christmas decorations such as crèches, and supposed relics. The Bible doesn't specify when the Wise Men arrived to find Mary and Jesus, what caused the bright light in the sky to direct their path, how many traveled together to find Jesus, etc. Even their names, races, and countries of origin are mysteries, despite the consistency of most Americans' traditions that don't waver from the "facts," suggesting they are facts indeed. The author was smart to recognize the many unknowns in the biblical account and recognize a story was there. He could liberally use creative license for his characters and plot without drifting from the Bible and long-held traditions. I won't introduce a spoiler, but even in the last chapter, which tells the decades-later fate of Melchior and Gaspar, two of the Wise Men, the text might seem too convenient or rushed (as some reviewers have written), but this scene, too, is consistent with some Christians' traditions. The Bible passages and dialogue that focused on (1) Mary's burden of bearing a child that wasn't her husband's (or boyfriend's, at the time) and (2) the foreboding of John the Baptist's and Jesus' suffering and death. The author, again, stayed true to the Bible and tradition and described Mary's pregnancy and birth as an immaculate conception and not, for example, that Mary secretly cheated on Joseph, got pregnant by an unnamed stranger, and concocted a story about her miraculous pregnancy to save her relationship (and her life). And the author never mocked visits by angels, prophetic announcements (e.g., Simeon, although the prophetess Anna didn't make her way into the book), etc. Other characters in the book might have scoffed at what Mary and Joseph knew to be true, but the author presented these inter-character conflicts as "the blind could not see." For those who thought the book had lots of shortcomings, if you're so inclined, read the Gospels of Matthew and Luke in the Bible and brush up on your magi-tradition knowledge. I think you'll see the author did a great job of crafting a very original story that stayed true to what is known or believed about the Wise Men, Mary's pregnancy, Jesus' infancy, Herod's reign of terror and death, Roman conquests, and even the Great Fire of Rome in A.D. 64, when active persecution of Christians (and, hence, deep-seated faithfulness to the church and to other believers) escalated. I liked it from beginning to end! 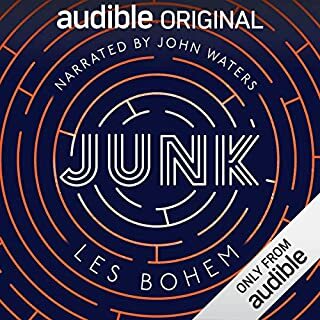 The narrator was amazing and story did not disappoint. Definitely worth listening to!